Location: Nailed to the wall of the GWAR fortress. My army's theme is Dark Angels infiltrated and corrupted by the Alpha Legion, so I'm adding some scouts to my army for fluff sake. 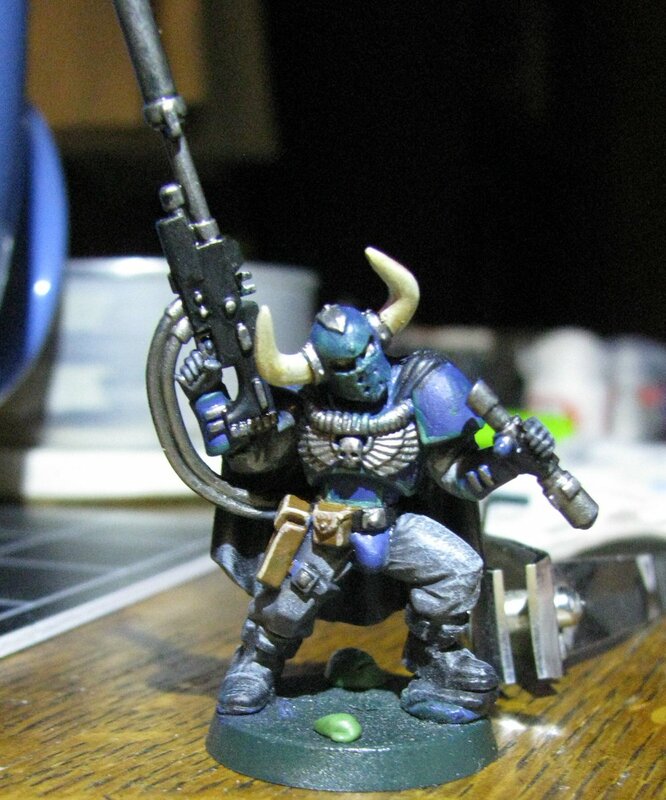 I had some extra bits and want to make a unique scout sargent. Why chaos warrior legs? They were the only spare legs I had. But I'm looking for suggestions on how else I might make him a little more unique. My first thought is cutting the horns off. I have plenty of spare bits from bit bag scavenging. More or less finished. I'm not very good at free-hand painting yet, otherwise I'd put some hydra marks on his helmet. Not the same model, but its the same head. I'm working on a whole squad of them. I only wish the rest of the helmets came out as great as this one. It looks well done! To me, it strikes a chord with Alpha Legion - he looks like a normal Space Marine but then BAM turns out it was Alpharius all along.